It is no surprise that I am a huge fan of a good statement necklace. So I knew that I had to have this shirt from Elysian Boutique. I love everything about it. 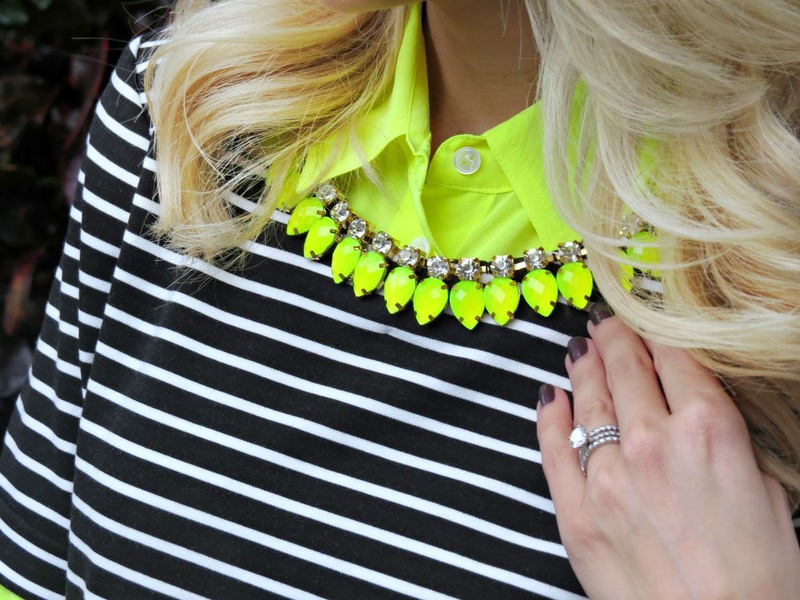 The neon statement necklace (that is attached), the stripes and the fit! I have been seeing tons of shirts and sweaters that have a necklace built in at J.Crew! Its a huge trend right now and this one os a fraction of the price. I love adding some neon to my fall and winter wardrobe. I love the color of your necklace and buttondown! So much fun! Love the pop of neon! That necklace is gorgeous! Love the pop of neon, love this look from top to bottom!! forget about the lovely colors during these fall and winter seasons! You always accessorize so well! Look fab as ever! Jade, you always look just gorgeous! So cute! Love the neon blouse with the black and white stripe top over. Fabulous look! I am so in love with NEON - that looks amazing on you! Eeek! What an awesome top! I totally thought it was a sweater with a necklace. Too pretty! I wish I could make neon look that classy, haha!